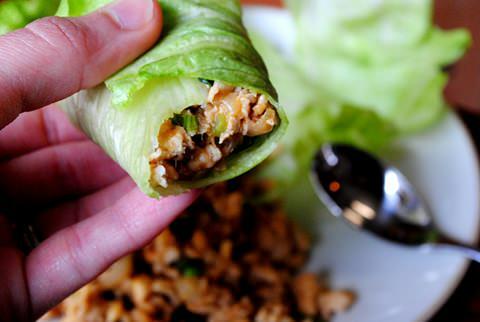 If you've ever been to a PF Changs, you know how freaking awesome their lettuce wraps are. I don't think I've ever been and NOT gotten the lettuce wraps. Seriously. You are missing out if you have never had them before. So go. RUN to your nearest PF Changs and order up some. OR .... you can make your own. This recipe was so simple to follow, despite the large ingredients list. It took me less than 30 minutes to cook, from start to finish. There definitely is enough for 2-3 people and we had no leftovers due to my husband chowing down on every last little bit. I definitely recommend making this as soon as possible. It's extremely tasty! Nom! 1. Heat a large, non-stick skillet on high. Add chicken, onion, salt & pepper, and cook until chicken is nearly done, stirring often to break up the meat. Add in minced garlic and ginger, and continue cooking until chicken is no longer pink. 2. Meanwhile, in a microwave safe bowl, combine sesame oil, soy sauce, water, peanut butter, honey, rice vinegar, chili garlic sauce and pepper. Microwave for 20 seconds, then stir until smooth. Add into the skillet and stir to combine. 3. Add green onion and water chestnuts into the skillet then cook for 1-2 minutes until the onions are soft and the water chestnuts are heated through.